Brought to you by Artifex Mundi, the creators of the Enigmatis series and Grim Legends: The Forsaken Bride. 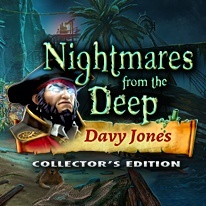 Nightmares from the Deep: Davy Jones Collector's Edition is the final chapter in the pirate trilogy Nightmares from the Deep, and tells the story of fearless museum custodian Sarah Black and her daughter, Cory. - Achievements, wallpapers, soundtracks, concept art, and more!